From conception to production, the design of consumer products requires both a variety of development resources as well as an adaptable environment in which to innovate. High performance computing hardware and software is needed to run materials analyses on bicycle frames, fatigue analyses on tennis shoes, and vortex modeling of a spinning soccer ball. Consumer product companies worldwide are accessing the immense compute capabilities of Rescale's platforms. Here is how one bicycle manufacturer optimized performance using the ScaleX Pro platform. 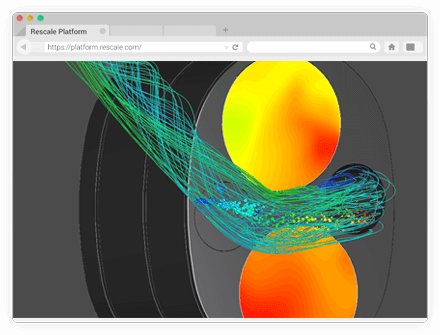 From chemical kinetics for combustion analysis to intake and exhaust simulations to piston deformation, automotive engineers run an expansive range of computer-aided engineering (CAE) simulations on Rescale's platforms. With the ability to instantly scale the hardware regardless of the workload size, automotive companies are able to stay on the leading edge without the leading edge costs. 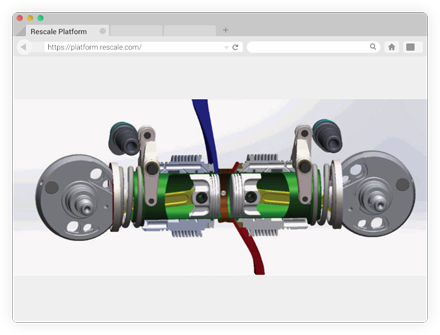 Below is how an engine manufacturer customer deployed Rescale's ScaleX Enterprise. Aerospace engineering requires significant compute resources to perform massive scale structural, fluid dynamics, thermal, and electrical analyses. Rescale's customers leverage the latest technology to analyze aerospace applications, ranging from complex turbine analyses to analyzing the structural integrity of wing designs to modelling propulsion flow. 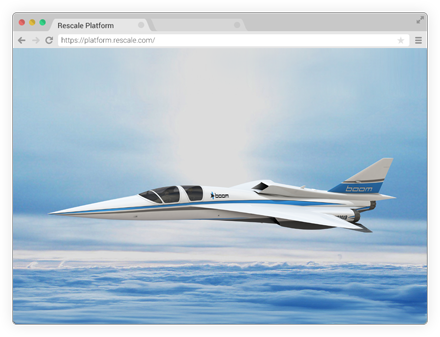 See how one of Rescale's aerospace clients leverages Rescale's ScaleX platform for ITAR sensitive applications. Boom’s supersonic demonstrator, the XB-1, was simulated entirely on Rescale’s platform for cloud HPC. Increase simulation throughput and reduce time to market by scaling out and parallelizing their jobs on Rescale’s virtually unlimited cloud hardware. Scale the business quickly by automating the company’s simulation workflow and centralizing data management on the Rescale ScaleX platform. Eliminate in-house IT overhead. Instead, they are able to focus 100% on product development. Scientists are running compute intensive genetic engineering analyses, bio-sequencing simulations and more, leveraging Rescale's simulation platforms. Using optimized file transfer technology, scientists can transfer the large quantities of data needed to perform molecular docking and quantum chemistry analyses to the Rescale's platform. ScaleX Pro and ScaleX Enterprise feature built-in collaboration tools to increase productivity and allow scientists to better isolate genetic traits, develop improved antibiotics, and predict fire flow patterns. Here is how a biotechnology researcher used Rescale's cloud simulation platform. Scalability and flexibility. These are just two features of Rescale's simulation platforms that help petroleum engineers define reservoir simulation workflows and geologists create analysis workflows to help identify hydrocarbon traps. Engineers use ScaleX Enterprise and ScaleX Pro to perform simulations on drillings, reservoir geomechanics, and deepwater systems, among others. Using Rescale simulation workflows, engineers can consider all possible options and calculate adjustment sensitivities made to highly complex systems, ensuring optimal field production. Below is how one energy client utilizes Rescale's platforms. While engineering simulations require HPC resources, it can't be overlooked that the computing hardware itself was designed and engineered as well. Electrical engineers are utilizing Rescale's simulation platforms to develop powerful and robust printed-circuit boards, integrated circuits, cooling equipment, and power storage, among others. With natively integrated design of experiment and optimization tools, electrical engineers can run complex thermal analyses or minimize noise margins easily from any computer. Here is how a large electronics enterprise optimizes simulations with Rescale's platforms. Enterprise companies are not the only organizations requiring expandable compute capacity for research. Academic institutions often experience lengthy internal queues and limited resources that are not necessarily optimized to handle engineering and science simulation workloads. Through Rescale, researchers, students, and professors have access to the latest computing technology. Flexible pricing tiers and the ability to use existing software licenses provide academic members with a cloud simulation platform that is capable of handling all types of needs. Rescale gives startups a competitive advantage. We provide early stage companies with big compute capabilities rivaling that of large enterprises and institutions, combined with the agility of the cloud, through an affordable and easy-to-use online platform. We enable startups to scale out their simulations on thousands of cores at once, vastly accelerating and parallelizing their simulation workflows with zero capital expenditures. For unmatched flexibility, HPC in the cloud can be scaled up or down to match both compute demand and cash flow requirements. Rescale together with our partners offers deep discounts on on-demand software and cloud HPC through the Rescale Startup Program. Machine learning R&D, especially in the field of Deep Learning, attempts to mimic the neural networks of the brain to complete human-level tasks such as image recognition and natural language processing. Deep Learning is extremely compute-intensive and requires state-of-the-art graphics processors. Research is typically constrained by expensive specialty hardware. Rescale\'s platform supports popular deep learning software packages and provides unlimited, pay-as-you-go access to the latest GPUs so organizations can stay on the cutting edge of R&D. 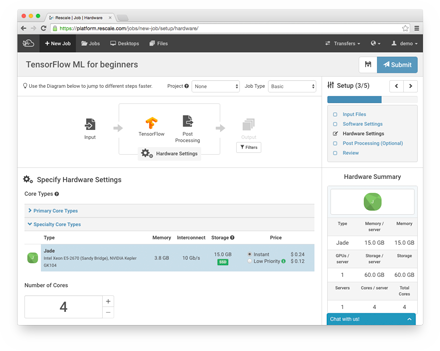 An intuitive, web-based workflow and excellent customer support make setup and execution easy. State-of-the-art machine learning software: All the latest versions of popular libraries, including TensorFlow, Keras, Caffe, Torch, Chainer, Nolearn, and Pylearn. All configured to run on GPUs out-of-the-box. Setting up your algorithms and configuring hardware is quick and easy with Rescale. Just upload your input file, select your software, select your hardware, and you're up and running in minutes.